Having dry and chapped lips happen more often for me in the winter months. 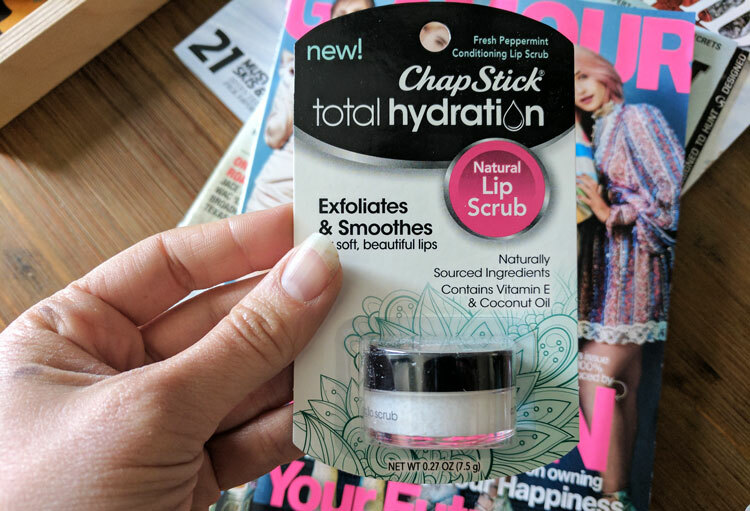 Although this winter has been fairly mild, there are still days I am licking my lips and thinking, “I need to hydrate these lips pronto!” My go to lip balm has always been Chapstick® – they are just the experts in lip care! Chapstick® is always on top of the lip balm game. 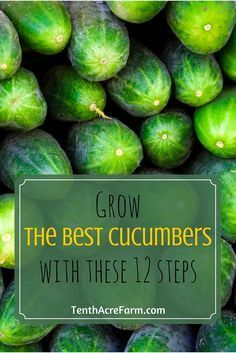 They have the best flavors and are frequently coming out with new products. The latest of the products being ChapStick® Total Hydration Moisture + Tint and ChapStick® Total Hydration. 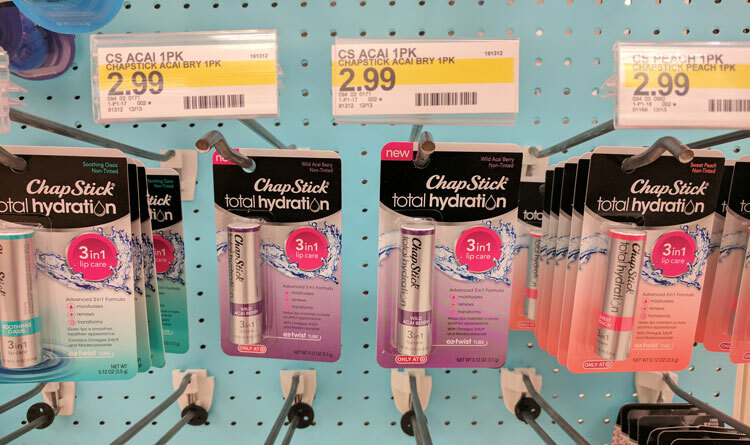 I found ChapStick® Total Hydration in the beauty aisle at Target. ⇒ ChapStick® Total Hydration: Lip Care with CoQ10 (Vanilla Cream), 3in1 Formula (Cooling Peppermint), 100 % Natural (Honey Blossom), & Conditioning Lip Scrub (Fresh Peppermint). 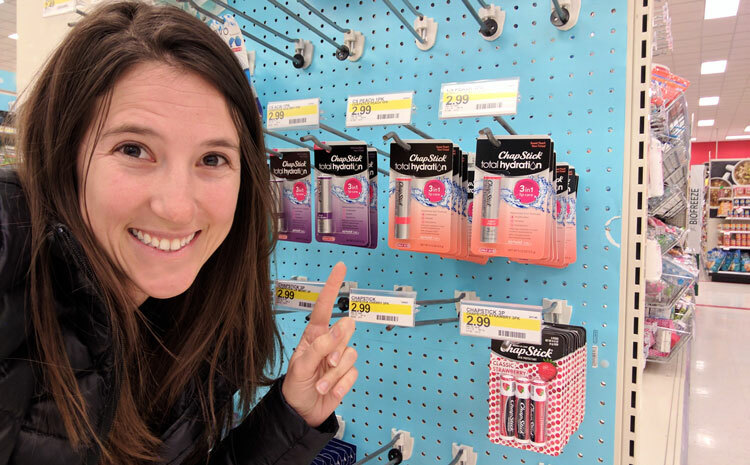 I took a ChapStick® “shelfie” in the Target Beauty Aisle! ChapStick® Total Hydration Moisture + Tint is the first-ever tinted lip balm from ChapStick®. This tinted moisturizer features a formula with 100% naturally sourced ingredients that deliver long lasting moisture, plus a hint of alluring color specifically formulated to enhance the lips’ natural color. The Total Hydration Moisture + Tint formula is perfect for major hydration and a pop of color! I am happy about the premium ingredients in this lip balm, including Rosehip Oil, Jojoba Oil and Avocado Butter. Out of the three shades – Rose Petal, Coral Blush and Merlot – Coral Blush is my favorite. Suttle with some sass and looks great on. ChapStick® Total Hydration 100% Natural is an age defying formula with 100% naturally sourced ingredients like Argan Oil, Omegas 6 & 9 and Avocado Butters. It is clinically proven to provide healthier looking and more youthful looking lips. Total Hydration 100% Natural is available in three flavors – Fresh Citrus, Soothing Vanilla and new Honey Blossom. This is my go to for everyday use! ChapStick® Total Hydration 3in1 provides triple action lip care in one lip balm. It moisturizes, renews and transforms lips to provide smoother, healthier looking lips. The triple action renewal formula contains unique ingredients like Madecassoside and botanical oils. Wearing this hydration formula makes my lips so soft and smooth. It is available in five flavors – Coconut Hydration, Soothing Oasis, Sweet Peach, Wild Acai Berry and Cooling Peppermint. ChapStick® Total Hydration Conditioning Lip Scrub is the latest innovation from ChapStick®. This lip scrub gently exfoliates and conditions the lips, resulting in silky, soft and smooth lips. This Lip Scrub is formulated with naturally sourced ingredients, including Sugar Crystals, Maracuja and Coconut Oil, Shea Butter and Vitamin E. To apply, all it take is a small amount! Just put onto wet lips in a circular motion then rinse or wipe off with a damp cloth. Your lips will never feel as smooth and the peppermint makes them kind of tingly! It is really enjoyable! Find all the ChapStick® Total Hydration products exclusively at Target. Giveaway! 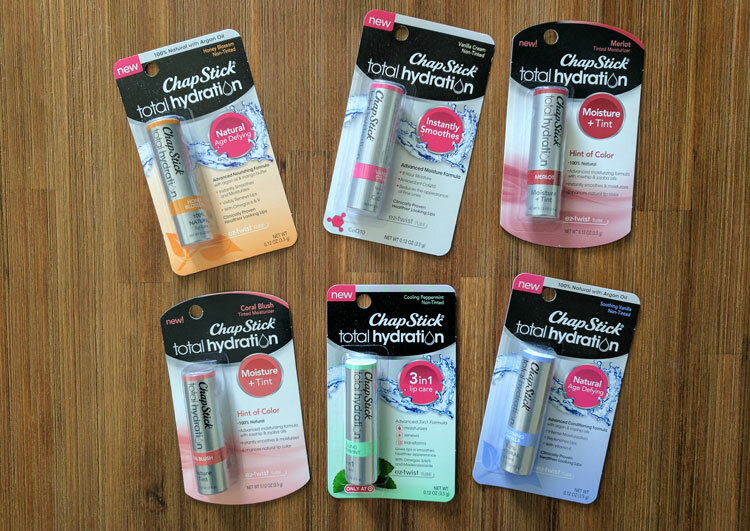 Enter to win ChapStick® Total Hydration products and a $25 Target gift card. Follow ChapStick® on social media – Facebook, Twitter, Pinterest, Instagram and YouTube. Disclosure: “This post has been sponsored by Pfizer Consumer Healthcare.” Please consult the FTC Endorsement and Testimonial Guides for more information. Please assure that all statements you make regarding the products reflect your honest opinions based on your actual experience in using the products. Please note, if Pfizer Consumer Healthcare provides you with product samples for distribution, you will only distribute such products as instructed and you will not knowingly distribute products to health care professionals. I love Chapstick! I had not seen the Total Hydration before, I am going to have to pick some up the next time I am in Target it sounds great! I keep myself in a steady supply of Chapstick all winter long. My lips get so dry and cracked if I don’t! I go through Chapstick like it’s going out of style. Up here in Chicagoland, the winter can absolutely KILL your lips. I don’t think I could survive winter without Chapstick. The air is so cold and harsh during the Chicago winter so I’m always looking for ways to protect myself. I love Chapstick. This is my family’s favorite brand, so I make sure I stock up on this. We do not experience winter here. But there are instances that I experience dry lips during rainy season. I would love to try their products. I love ChapStick. I have been using it for years. I always have a few in my bag and in the car. I use this and it is amazing. I love giveaways! I can’t wait to enter. I love the total hydration chapstick! I have never tried the tinted ones though! I love the citrus one! 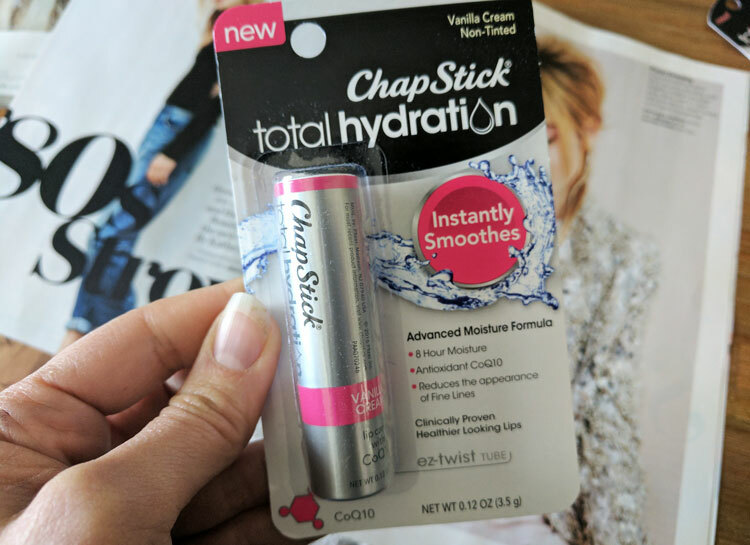 I love Chapstick and I need to try this total hydration kind!! My lips are so dry right now!! Chapstick is such a wonderful and trusted brand for so many! 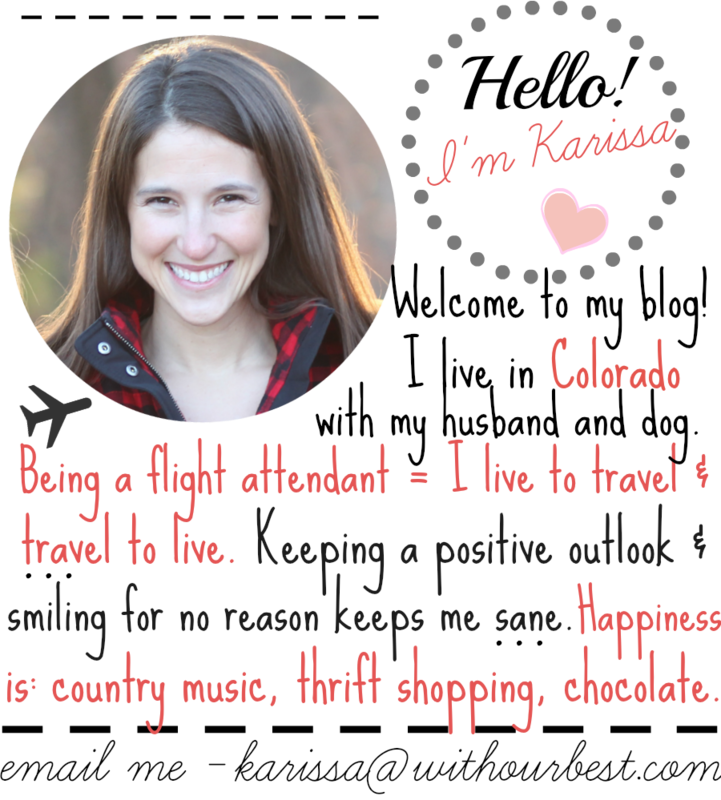 I love their products – sounds like I’ll need to try a few more! I love Chapstick. Santa brought me several for Christmas. I tend to lose them so I asked for several. Chapstick has always been my favorite. I will have to try the new total hydration line now. I use to use chapstick but then I found out it was made with a lot of alcohol. Maybe they’ve changed it up since then though! I had no idea that Chapstick had so many different varieties. I’ve been using Burts for so long because they have so many varieties but I may need to try the Chapstick with the CoQ10.